Was aiming for a snowball cake here but shake and vape, this tastes (to me) like a Hostess Cupcake. I don't taste the coconut at all... However, others taste the coconut. So I'm not quite sure about this... It's somewhere between a Snowball and Hostess Cupcake. Either way, it's really good. I was lucky enough to get to try this one in Mixers Club without having to hunt down all the flavors I don't have. 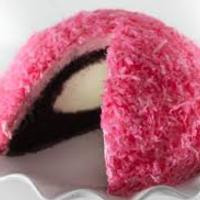 The chocolatey part is on point and it has a nice fluffy cream filling to go with it. The coconut needs a steep, but it is definitely there if you are patient enough to wait. For a true Snowball flavor it might need to be bolstered up a bit but this is a delicious recipe just as it is. I am going to show that I can rise above my petty neurosis and not deduct a point for using a pink picture when I know for a fact you found pics of white ones. SNOWBALLS ARE NOT PINK, HOSTESS CORPORATION!!!!!!! Somewhere between a Snowball and Hostess Cupcake sounds about right to me, though the coconut is a little toasty and the Snowball's coconut flakes are raw. The overall amount of coconut is too light for a Snowball but I can definitely taste it. I'm sorry for anyone who can't because it's very nice. Regardless, it's a nice chocolate cake that even has that mass-produced Hostess flavor, with a fluffy cream filling. Sometimes you just have to stop worrying about what it is just worry about how it tastes. It tastes great. Since I find Lava Cake basically has no cake at all and is pretty much a hot fudge sundae topping flavor (a yummy one at that), I'd been wondering how it would react to having some JF Yellow Cake added to it. I appreciate this answering that question; it makes a Hostess chocolate cupcake flavor.